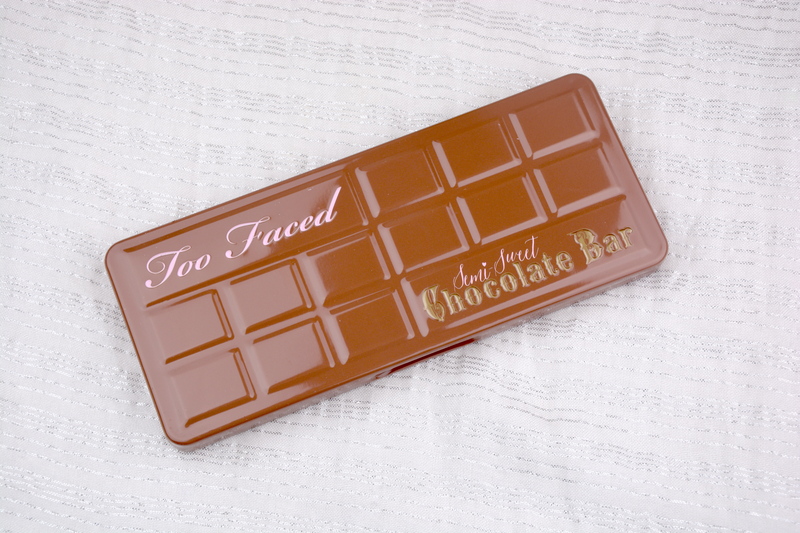 I mentioned in my review of the original Too Faced Chocolate Bar Palette that there were rumours of a second palette being released and I guess you can tell from the title and content of this post that they were true. This palette has not been released in the UK yet but it was available for Sephora VIB and VIB Rouge members to purchase early before it was released for everyone else, so of course I snapped it up. I have already mentioned how much I love the original palette in my November Favourites, so I have high hopes for this palette. 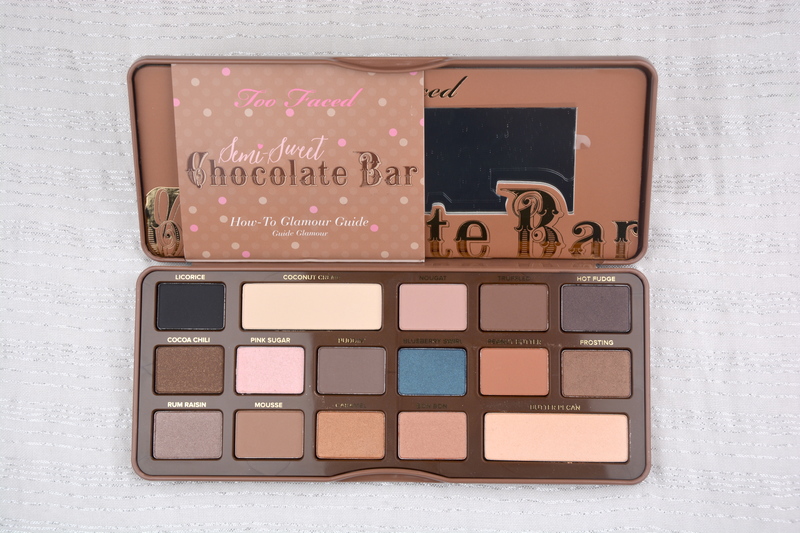 The Too Faced Semi Sweet Chocolate Bar Palette is supposedly the warmer of the two palettes and while it does contain warm shades I do not feel there is much difference in tone between the two palettes. Once again the packaging is a metal tin with a magnetic closure and small mirror in the lid – the tin is also a lighter brown so it is easy to tell the two apart with a quick glance. One of the differences between the two palettes I like most is they have done away with the plastic insert – hurrah – and the colour names are now printed on the actual tin. The names still follow with the chocolate and dessert themes and the shadows themselves still smell of chocolate. Unfortunately they have not made the two larger shadows transition/crease type colours, they have stuck with having two large highlight shades (one matte and one satin), which is a shame but it will not affect my over all opinion of the palette. First I will show you the colours in this palette and then do a quick comparison with the original palette. Licorice is a medium matte black. Coconut Crème is a matte yellow toned beige that is quite similar to White Chocolate in the original palette. Cocoa Chili is a medium dark warmed toner brown with what looks like multi colour glitters that do not really transfer when swatched. Pink Sugar is a light baby pink with pinky/purple glitters. You will see below that the base colour does not transfer when swatched, just the glitters do. 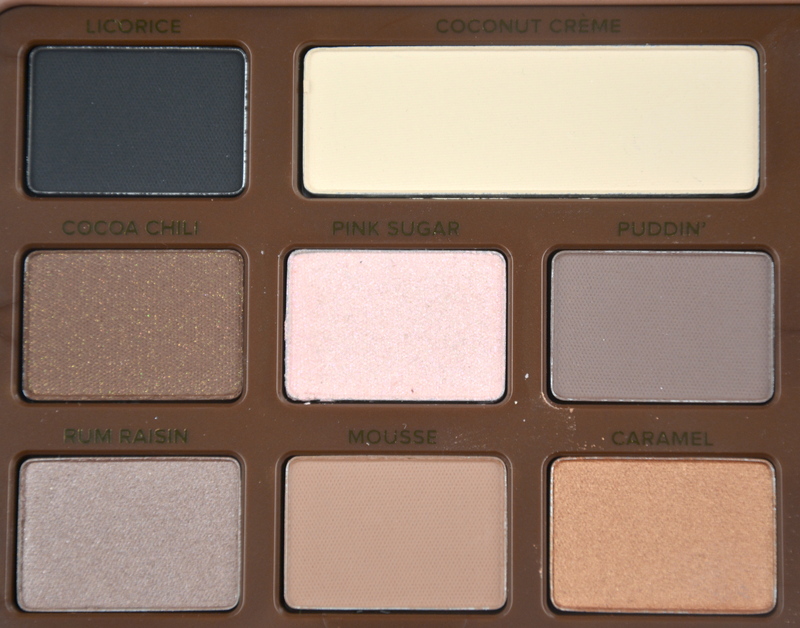 This is probably the most disappointing shade in the palette. Puddin’ is a matte cool toned medium dark brown that looks slightly grey when swatched. Rum Raisin is a medium taupe brown with a satin finish. This is one of my favourite colours in this palette. Mousse is a matte light medium warm toned brown. Caramel is a gold with a hint of copper in a satin finish. Nougat is a muted dusty peach with a matte finish. Truffled is a medium warm toned brown with a matte finish. Hot Fudge is a dark brown with a hint of grey and mostly a satin finish, though there are a few glitters in there, these do not appear to transfer when swatched. Blueberry Swirl is a medium dark blue with blue glitters and a satin finish. Peanut Butter is a rich warm toned brown with red undertones and a matte finish. Frosting is a bronzed brown with a satin finish. Bon Bon is a muted coppery brown with a satin finish. This is another of my favourites in the palette. Butter Pecan is a light gold shade with a satin/frost finish. As you can see there is a great range of mattes, glitters and satin shadows in each palette and there is also a good range of light to dark shadows in both. Whilst there are some comparable shades, for me, it is different enough to justify having both – that is what I am telling myself anyway. Do I think you need both? Probably not. 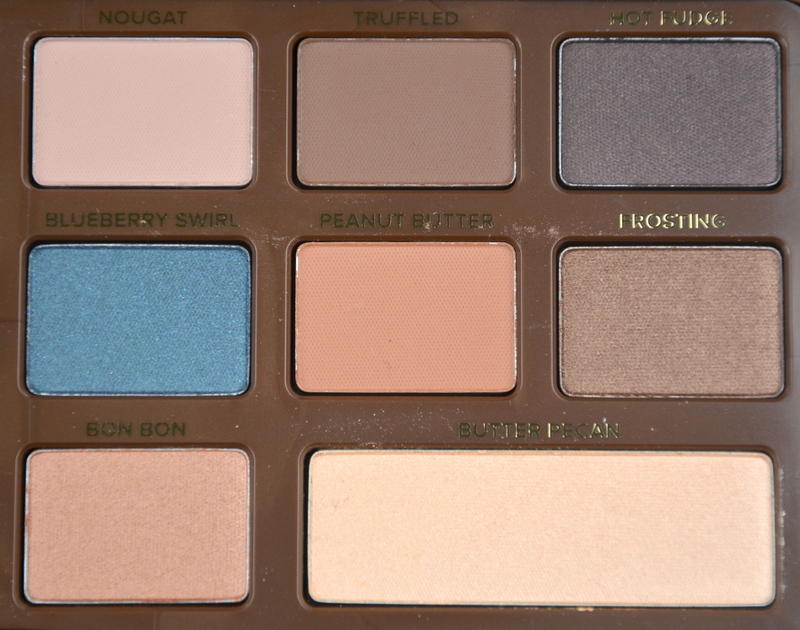 However, if you are a neutral eyeshadow junkie like me then I would say yes you need to get this palette. The shadows have the same good pigmentation as the original palette and feel lovely and smooth when they are swatched. 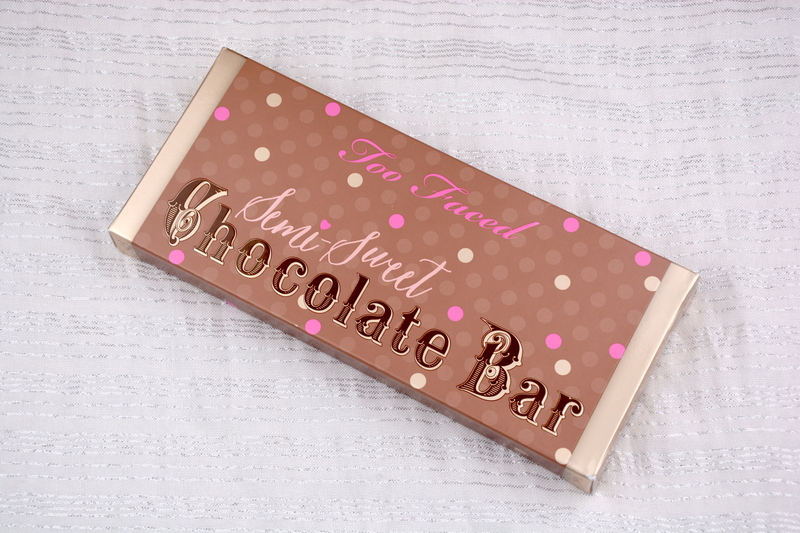 Too Faced Semi Sweet Chocolate Bar Palette retails for $49 and is available here. I believe it is due to be released on 19th January in the UK and will be available from Debenhams. Great blog btw, it’s good to see a uk blogger talking about this palette as I’ve had my eye on this one for a while now. I have the original and I love it!